A look at the fiction in the September 2014 issue of KZine, the Kindle only magazine containing science-fiction, fantasy, crime and horror stories. Issue ten of Kindle magazine KZine contains stories from Paul Finch, Ryan Priest, Dawn Lloyd, Colin Heintze, DL Young, Tim McDaniel, Philip Roberts and Jon Arthur Kitson. This September 2014 issue has the usual blend pf science-fiction, fantasy, crime and horror. The magazine is edited by Graeme Hurry and the cover is by Dave Windett. 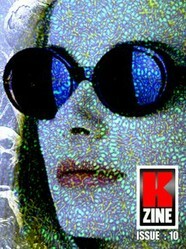 KZine is a science-fiction, fantasy, crime and horror magazine for the Kindle. Published three times a year, it aims to provide original genre fiction for the mobile reader. This issue (Issue Ten, September 2014) contains eight stories, of which “Kampus” and “Bad Habits” stand out, and “Renewal” deserves a mention as the funniest story I’ve read for a long time. But the best for me was the tense “Learning to Fight” by Dawn Lloyd. This is a story within a story as the narrator recollects a ghost story told by his grandfather about how post WWII Germany came to affect a little boy one Christmas Eve after the war. The title is the name of the evil version of Saint Nikolaus in Germany, the one who punishes naughty children. If you want to frighten your children before they visit Santa’s Grotto, then read them this. This feels more like a scene from a story than the finished article. Jens is one of a few survivors and he attacks a commune being held by nine men. And that’s it really, though well told and you do get to understand the driving forces of this killing machine. Reha’s poetry and pacifism have her branded a traitor, but when her father is killed she changes. Now she has the job of escorting a prisoner to torture and death. Can she do it? Who will come out on top, her or the prisoner? This tale oozes suspense from beginning to end. Gripping. Tom Maple is called on to investigate a punter at a casino who seems to be beating the odds. Despite the mistrust of the establishment’s own security guard Bill, he works out how he’s doing it. The casino though wants its money back and Bill is suspicious about how quickly Tom sussed what was happening. So, who is playing whom and who is working whom? A nice little crime mystery that keeps you guessing till the end. Deke looks after the robots that scavenge the dump, but what he wants is a woman to keep him company. Chang, the boss’ right-hand man, forbids it. Then Deke has an idea. A class-based insight into how one man tried to pull the wool over another’s eyes, and more than a little depressing. Worth reading nevertheless. This is so short that it is hard to say a lot without ruining it. Let’s just say I was literally laughing out loud when I read the last line and what it meant sank in. There is a stranger in town, one buying up land around his smallholding, and one about whom the rumours quickly spread, especially when folk start disappearing. Told through the eyes of an eleven-year-old, this horror story doesn’t really hit the spot for me. Mystery can be good, but sometimes the readers deserve some answers, and we didn’t get them. A father takes his two sons bowling in a closed alley into which they have to break. As they play and fool about, we gets hints of a family loss, the boys’ mother. There is a small twist in the tale at the end, but the whole is little more than described here. The guest editorial is by author Mark Morris and he recalls his fascination with horror from an early age, ranging from the monsters in Doctor Who to the Pan books, both favourites of mine, then and now. And, like me, he graduated to the novels of James Herbert and Stephen King. He has now edited his own anthology – The Spectral Book of Horror Stories – and it sounds like it might be worth a read. As usual, the author biographies are all together at the end. Personally, I wish these were tagged onto the end of each story to make it easier to read about the author immediately after finishing the story. Steve Rogerson looks at the fiction in the July-August 2014 issue of science-fiction and fantasy magazine Interzone. The story of a woman who accidentally becomes a fairy and would rather she wasn't.